Regardless of the industry they are in, all businesses strive to attract new leads and have prospective customers interested in the services they provide. Outdoor signage is one of the best ways to garner attention for your business and attract new leads who may not have even heard of your company. Outdoor signage offers a myriad of benefits to business owners. For starters, a sign can help brand your business. The best example of this is the McDonald’s sign. Anytime someone sees the golden M in front of a building, they immediately recognize the fast food company, and think of the menu offered inside. Similarly, an aesthetically pleasing sign for small businesses can have a meaningful impact. A deftly placed, appealing and luminous sign can help separate businesses from their competition, and help conjure up an image when people see, think or hear of your business. Moreover, the sign on that logo can be used in other places, such as in newsletters, emails, Facebook pages and other advertising vehicles businesses in use in the 21st century. 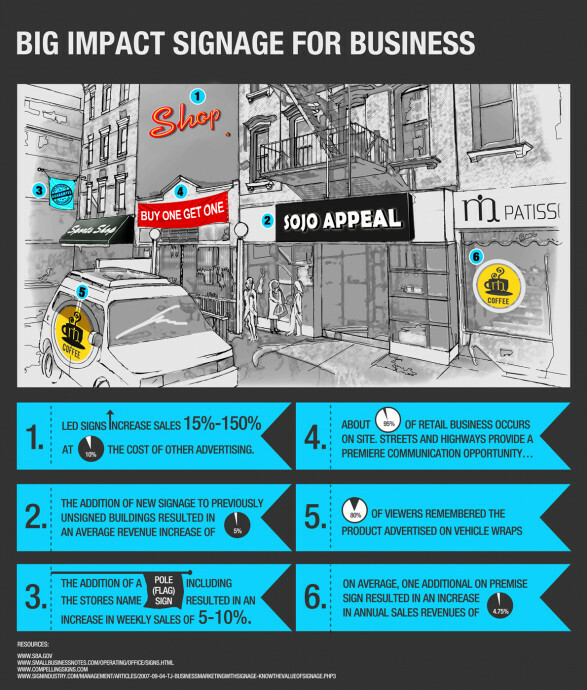 Below is an interesting infographic that helps convey the importance of businesses differentiating themselves with outdoor signage. As evidenced by the illustration, a visible and radiant sign can surely help grab the attention of people walking, jogging or driving by your business, and can help establish your company within your town or city.